Digital design and fabrication techniques allowed researchers in Switzerland to create a curvy, super thin concrete roof that will one day help a residential unit produce more power than it consumes. Using the innovative methods, the researchers assembled the roof with much less materials than would otherwise be needed. The concrete roof is also equipped with thin-film photovoltaic cells to generate energy. 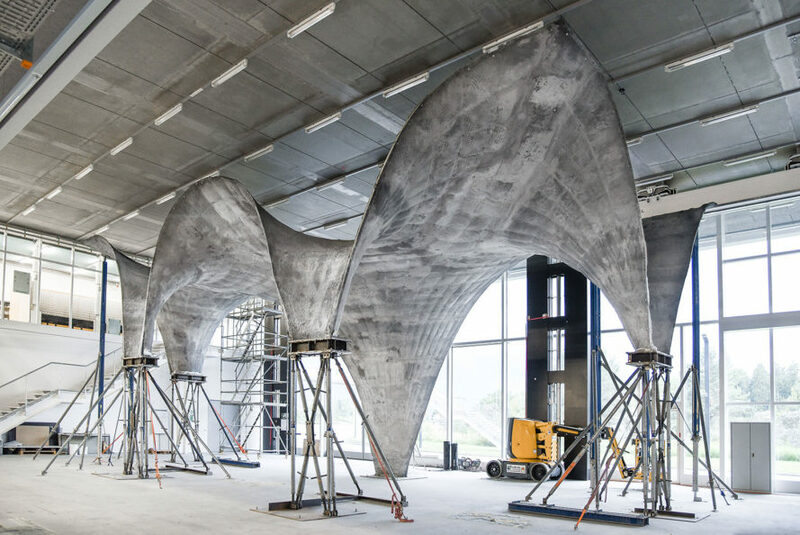 Researchers at the Swiss Federal Institute of Technology Zurich (ETH Zurich) recently unveiled the prototype for a sinuous, self-supporting concrete roof. The roof is comprised of multiple layers, including concrete, heating and cooling coils, insulation, and more concrete fitted with thin film solar cells. The prototype was around 25-feet-tall, with a surface area of around 1,722 feet squared. The average thickness of the concrete was around two inches; the support surfaces had a thickness of 4.7 inches and the edges of the roof were just around one inch thick. A cable net supporting a polymer textile provided the formwork for the concrete roof. The researchers used a precise concrete mix, fluid enough to be sprayed but firm enough to not flow off. The prototype has already been dismantled to make room for other experiments, but in 2018, the roof will be erected atop materials science and technology research institute Empa‘s HiLo Penthouse. Guest faculty will live and work in the penthouse, which is expected to produce more energy that it uses thanks to the concrete roof’s solar cells and what ETH Zurich described as an adaptive solar facade.